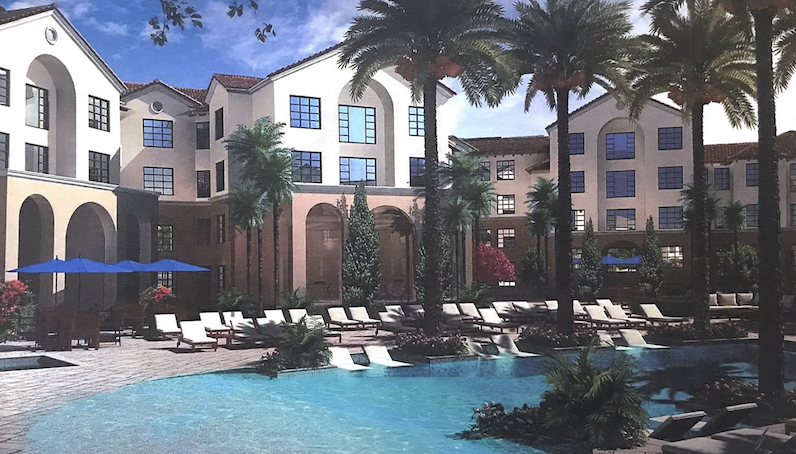 Rollins now plans to complete the new Lakeside Residential Complex in time for the 2020 Fall semester. This five-floor residence hall will contain all single rooms with private bathrooms and personal laundry units. It will also feature a community cafe, gym, pool, and grocery store. But many aspects of this project remain somewhat of a mystery to students. Who can live there? How much will it cost? What will the rooms actually look like? The Sandspur sat down with Leon Hayner, senior director of Residential Life & Explorations, and Meghan Harte Weyant, dean of students, to learn more about the upcoming project. How many students will the new building house? Who will get to live there? The residence hall will hold 125 units, or apartments, with 500 beds. It will be available for junior and senior housing on a priority basis, similar to the way that housing is offered now: graduation status, GPA, and collegiate standing. Hayner said students opting to live in five-person rooms in Sutton and sophomores who live off campus next year would have priority. “We feel like they’re making a choice that’s helping the college for one year by living off-campus, and we hope that they will come back, so we’re giving them that opportunity,” said Hayner. What is the layout structure of the rooms? Each apartment is sized at approximately 1,400 square feet, which will hold four rooms and four bathrooms—some may be two bedrooms and two bathrooms, depending on their location in the building. Each room will have a full-size bed, unlike the twin beds in previous apartments. The apartments will also contain a living room, laundry machines, and a full kitchen with a table. Hayner said that counter tops will probably be granite. The new residence hall, which should be completed by August 2020, will feature a pool and workout facility among other amenities. What other amenities will the building have? The building is being divided into two sections—one section where McKean is currently located will just be dorm rooms, and the other section, which is significantly larger, will be divided in half and incorporate a dormitory wing and a public space wing. The public space wing will be filled with lots of amenities, including offices and eateries. There will be a pool in the center of the two sections, a sauna, a full workout facility with studios for yoga, and a large locker room. Additionally, there will be a coffee shop, full kitchen, and multiple lounges and seating areas. Res. Life and the Center for Inclusion & Campus Involvement will be housed here, as will the Lucy Cross Center, the office that promotes gender equity on campus. Hayner and Weyant said that the cost to live in the new building will not exceed the current cost to live in Sutton Place Apartments. The typical Sutton two bedroom and two bathroom apartment, which houses four students, costs $11,000 per year. 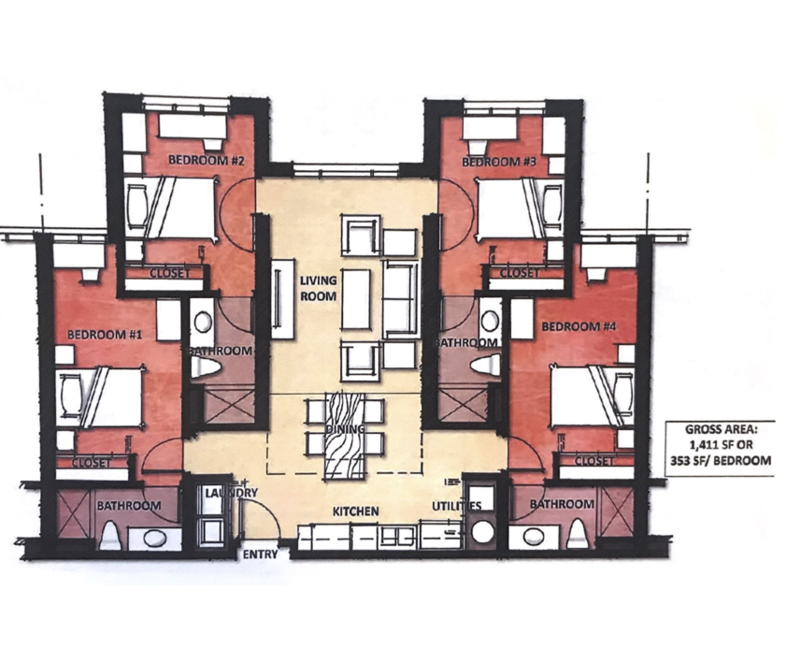 The cost of a Sutton apartment with single bedrooms is $12,000 per year. They have not yet set a specific price. Hayner said that the pricing will not be higher than anything they currently offer. The College hopes to have the project finished and ready for students to move into by August 2020. Weyant said that if amenities like the pool and workout facility are not finished, then students would still be able to move in. Their goal is to make sure the apartments are all completed and ready for the 2020-21 school year. What will the building be named? According to Hayner, a name has not yet been dedicated to the building. For now, it is referred to as “the Lakeside Residence Hall,” but it will receive a traditional name similar to other dorm buildings once it is built.